Germany has long been one of the world’s leading centers of the wind industry, so I welcomed an opportunity to question Esther Frey, renewable energies expert at Germany Trade & Invest (GTAI), about this technology’s effectiveness and future development. GTAI is the foreign trade and inward investment promotion agency of the Federal Republic of Germany. Ms Frey provided some valuable insight into the future of Germany’s Wind Industry. In addition to Climate Change, Western Europe’s drive to adapt renewable technologies arises from the scarcity of fossil fuels. Germany possesses enough lignite coal, but is dependent on imported gas and oil. This makes it vulnerable to external forces and unexpected price rises. Renewable energy sources offer a way to reduce dependence on imports and thereby improve energy supply security. Everyone knows that the wind does not blow 100% of the time. US wind farms, for example, are said to produce an average of about 32% of their nameplate capacity. In Europe they use the term “full load hours.” This figure is of limited value without knowing the break even point, and that is where things get complicated. There are other factors to be considered: geographical conditions, wind speeds, the cost of the project and the types of turbines that are used (characteristic curve etc). I was nevertheless impressed by the fact that Germany’s off-shore wind projects achieve about 51.4% of their equivalent full load. The estimates for onshore facilities are lower, the best performing areas achieved a high of 38% and the average is 27.9%. You can access a record of German wind loads on page 26 (of this document) but, once again, these figures are of limited value by themselves. Schleswig-Holstein is expected to achieve 100% of its electricity from renewables in 2014. Schleswig-Holstein hopes to be producing three to four times more electricity than it requires by 2020. As the wind is not constant, this technology requires a back-up. In another article, George Taylor of Palmetto Energy Research told me this is generally a fossil fuel producing plant (coal, or gas) and this can get expensive if they are run at less than 40-50% capacity. Around 25.4% of Germany’s electricity came from renewable energy sources in 2013 and 35% of this came from wind energy. Thus wind energy only supplied 8.9% of the nation’s electricity demand. upgrade the transmission grid so that it is able to transmit electricity from wind and solar efficiently from areas with overproduction to areas with a lack of supply. develop technologies that capture and store excess electricity until it is needed. 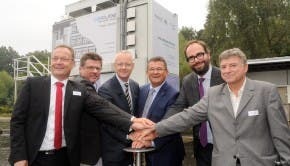 Vanadium redox flow battery pilot project in Schleswig-Holstein planned for summer 2014 with a capacity of 1 MWh – enough, in theory, to supply 100 homes for one day. It will be built to optimize the grid integration of the Braderup-Tinningstedt wind farm. A lithium-ion battery to store 5 MWh in Feldheim: planned to start operation this year. A project by Younicos in Schwerin: coming online in September this year, the 5 MWh battery will help stabilize grid frequency in the region. Power to gas projects (electrolysis): RH2-WKA pilot project in Altenbrak – running since September 2013; E.ON pilot project in Falkenhagen: the system output is two megawatts – equivalent to 360 m3 of hydrogen per hour. investments in the transmission grid will amount to EUR 21-26 bn over the next 10 years (NEP 2014, initial draft). Dena estimates that investments of between EUR 27.5 and 42.5 bn will be needed, for the period 2012-2030, for the integration of grid technologies (Dena Verteilnetzstudie). As a result of their switch to renewable technologies, Germany saved the equivalent of 148 million metric tonnes of CO2 in 2013 (electricity: 108 m tonnes, heat: 35 m tonnes, biofuels: 5 m tonnes – link). Despite this, the nation’s emissions have grown during the past two years. Ms Frey that while the retirement of nuclear power stations will play a role, no power stations were retired during this period. She pointed to a 34 TWh increase in energy exports as a more likely candidate.